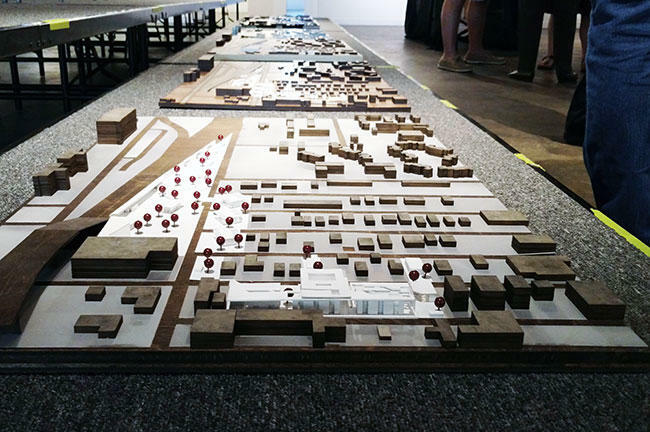 USF Architecture & Community Design students put together detailed models of their ideas for the re-development of Faith House Florida in St. Petersburg. Students Hala Barakat & Oscar Barnes (right) share their Faith House plan with organization officials and members of the public. 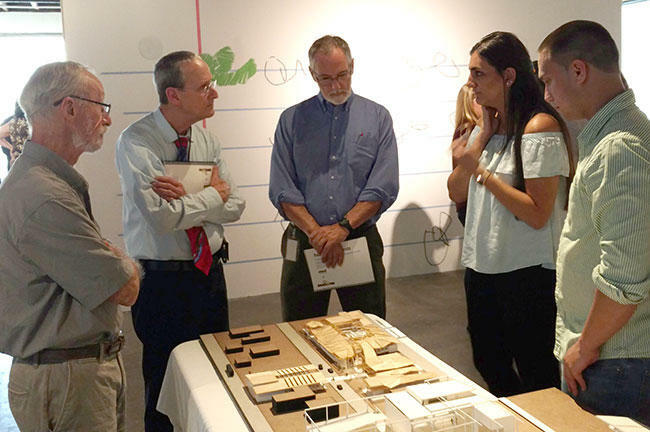 Extended University Beat report on the work USF Architecture & Community Design students did on the possible re-development of Faith House Florida. If you drive through the Unity Park area of St. Petersburg, maybe looking for parking for Tropicana Field, you’ve probably seen Faith House Florida - a collection of four brightly colored apartment houses and a garden on 15th Street North. What makes Faith House stand out in the oak canopy lined neighborhood, surrounded by single family homes, is that it’s a structured residential program for people battling substance abuse issues, recently released prison inmates and homeless people. But like many of these programs based in residential areas, the organization is making a concerted effort to fit in and be a better neighbor. 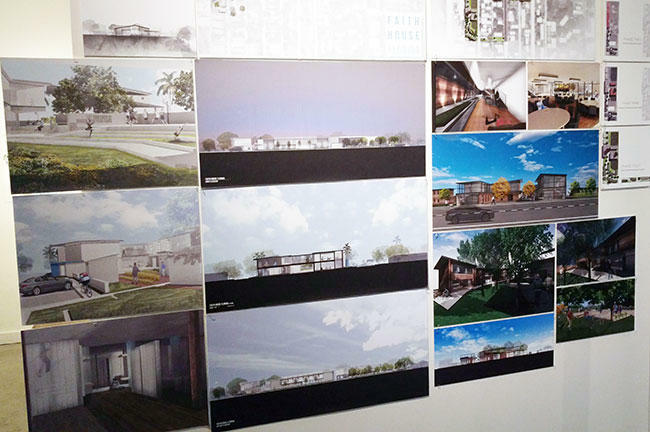 Renderings of one USF Architecture & Community Design student groups' plans for the re-development of Faith House. "There’s this infamous ‘not in my backyard.’ Well, we’re proud members, as Faith House, of Methodist Town – that’s the neighborhood we’re part of – we’re Methodist Town’s representative to the City Council," said Tom Shay, President of Faith House’s Board of Directors. "We’re not going away, but we need to be a responsible part of the community and that’s what we’re doing." To help in that effort, Faith House reached out to the University of South Florida School of Architecture and Community Design to create a plan that better integrates their program with the rest of Methodist Town. Professor Josué Robles oversaw the class of 12 masters’ students. "We wanted them to see that the location is not the area or the lot that Faith House owns – it’s the community in general," Robles said. "And we wanted them to consider the city as the host site, we wanted them to consider that (Faith House) had to be a welcome neighbor and to see them as a game-changer in the community, not an area that needs help." The students looked for inspiration by visiting several similar living communities in Georgia and Alabama, as well as by making several visits to Faith House. "They have been a joy to work with, they get it, they understand it," Shay said. "They have been on our campus, they have visited with the staff, they visited with the board, they visited with the residents, we have walked them throughout all of the neighborhoods, they understand even blocks away from us." "They understand what these people are going through and the type of help they need so they can get back to productive lives." According to Robert MacLeod, the Director of the School of Architecture and Community Design, that kind of immersion in this work can really help the students. "There’s almost a deeper investment on the part of the student in the project because they come to know the people that might inhabit a project such as this, so it winds up being even emotional for them, even moving experience for them," MacLeod said. One of the things about Faith House that stuck with fourth year graduate student Danielle Barozinsky is its community garden. While residents tend to it regularly, it’s open to neighborhood volunteers Wednesdays and Sundays. "It is developing that healthy relationship that I think we want with the residents who are coming in and re-establishing themselves and picking themselves back up and how to interact and how to take pride in the work that they do in the physical labor with what gardening is, but then seeing the outcome in how your labor can be reaching out to people," she said. The program has had such an effect on Barozinsky that she voluntarily helps Faith House refine its social media presence. Before that, however, Barozinksy and her classmates broke up into six teams, putting in hundreds of hours designing highly detailed models and renderings of buildings and outdoor areas that covered several acres. They presented them recently at Studio@620 in downtown St. Petersburg to Faith House officials. "When you look at all the little details that they have put it in here, they’ve hit all the trigger points," Shay said. "And there’s little salutes to things, there are items with...the 12 points, which reflects of the 12 points of recovery." Third-year USF Architecture & Community Design student Cesar Reyes (right) talks about his Faith House plans with St. Petersburg Mayor Rick Kriseman at Studio@620. Also in attendance were neighborhood residents and city officials, including Mayor Rick Kriseman. "It’s really fascinating looking at the thoughts that have gone into the different concepts and why certain designers have chosen to go in one direction versus the other," Kriseman said. "I’m a big believer in the more ideas, the better, and the more things to make you think and consider and contemplate the impact, the better." 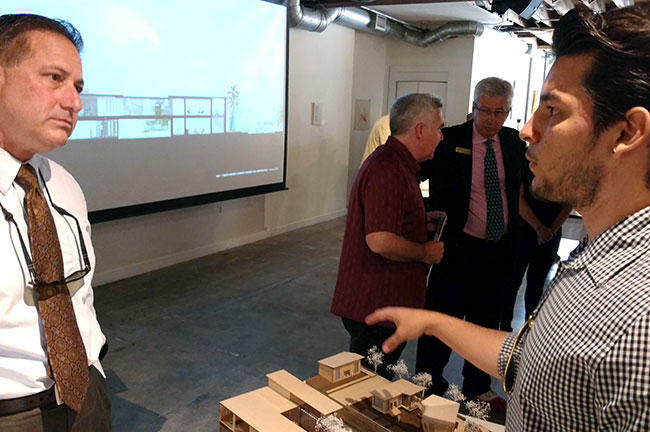 "I’ve seen the work of USF students in designing sites before in other projects," he added. "I’ve always been impressed and it’s always made me think and contributed to the way I’ve thought about approaching different challenges. " Third-year student Cesar Reyes appreciated being able to talk to the people who might one day turn his concepts into reality. "It expands a network as far as students," Reyes said. "I think they’re able to see some of the different ideas that we can bring to the table and can be achieved, it’s just a matter of people coming together and actually being able to make things happen." "It’s always a good sign if the mayor comes out and looks at your work, first of all, I’m still waiting for that!" MacLeod added with a laugh. "And I do think it makes it very special, I think it makes the students realize the value of their work and there’s nothing like civic leaders, community leaders and then the community members, coming and looking at the work, listening and responding in a very real one-to-one way with the students." And, based on what he heard from officials from both Faith House and the city, Professor Robles was optimistic that some of the students’ ideas might be used in Faith House’s eventual re-development. "So, some ideas have been really successful, some are too heroic and that the students are really great about doing this," Robles said. "But I think the students have done a really good job about keeping these ideas quite tangible and they have shown a tremendous amount of maturity and some of these could be implemented pretty much as they were developed." WUSF News "University Beat" report on the new "Hunger Action Alliance." It’s a problem that affects 700,000 people in the ten-county Tampa Bay area: food insecurity. Thomas Mantz, the Executive Director of the group Feeding Tampa Bay says food insecurity is when people like you and me don’t have consistent access to food due to a lack of money or other resources. Think back to the last time you had a salad. Was it one of those bags that you buy at a store, tear open some envelopes with the various ingredients, mix and eat? Or are you one of those folks with a green thumb who takes your vegetables all the way from seed to the salad bowl? Well there’s a class at the University of South Florida that’s trying to turn students from the former into the latter. University Beat report on the "follow your calling" research conducted by a pair of USF psychologists. In the 1980s, one bestselling book advised people to "do what you love, the money will follow." Others believe in the adage "do what you love and you'll never work a day in your life." 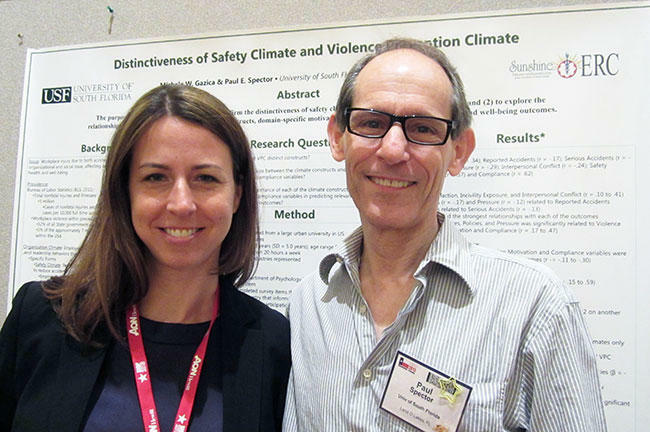 While neither of those concepts can probably never really be proven correct or not, a pair of University of South Florida psychologists are taking on a similar idea: if a person has a a calling, a form of work someone finds fulfilling, what happens if they pursue it - and what happens if they don't?